Ancient Stones - Lothian - 035 Standing Stone, Galabraes, Bathgate. 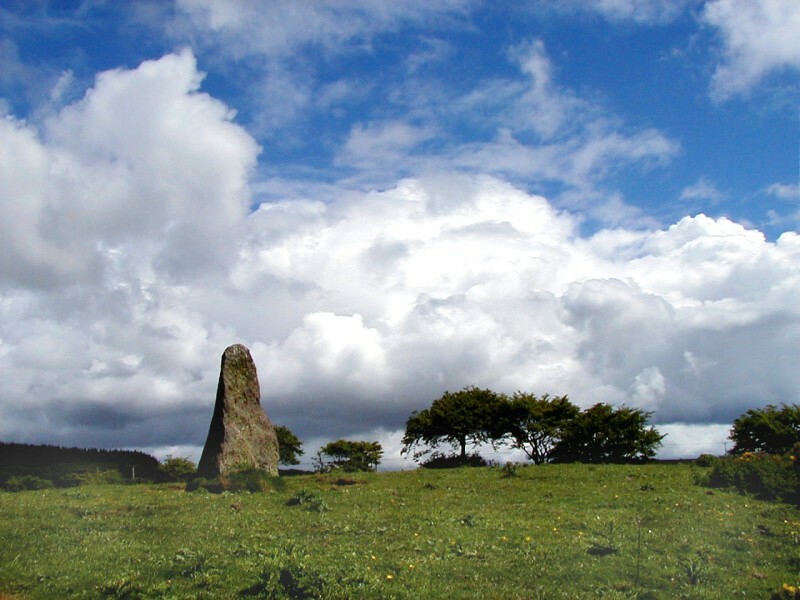 The solitary standing stone occupies a conspicuous position on the summit of an exposed ridge a mile or so north of Bathgate and reaches a height of 1.50m. Just to the west of the existing stone the filled-in socket hole of a second stone can be seen. The second stone was fragmentary and has since been removed. Take a minor road north from Bathgate, signposted for and heading for Cairnpapple Hill. The stone can be seen in the field to the west. By side of road at junction. I always find it sad when I visit a location where one or more stones were known to have stood there and have in recent times been removed or destroyed. This is one of those sites. You can even still see the depression in the ground a few metres west of the present stone indicating where the other stone once stood. The stump of the other stone, along with broken fragments, was recorded as being present in 1903, when the father of Mr Carlaw, the farmer of Gala Braes, found human bones when digging at the base of this stone.